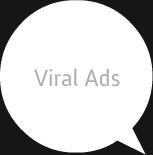 viral Ads spreading viral in today's interactive world. Online ads which get forwarded like a spreading viral are a rage in today's interactive world. Low on budget and high on market penetration, animated virals rule the interactive wish list of all the image conscious brands.